I know, I’m terribly behind. Sara did a nice post about it here, and Miriam did one here. So I went, I spun and we wove (almost) another shawl. This time we didn’t have loom problems. We were using a table loom, and this time our pattern just took to much time. Especially on the table loom. Our weft was a electric green and blue, while the warp was a dark charcoal gray. Unfortunately I didn’t get any pictures of it, but there are pictures on both Sara’s and Miriam’s posts. In between spinning sessions I did manage to get a little shopping. Here are the goodies. I’ve been feeling a little Sock yarn crazy lately. It must be these Sock Knitters Anonymous challenges that have got be constantly thinking about socks. 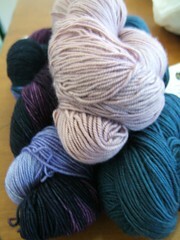 This is beautiful sock yarn from Anogora Valley. It’s now spending it’s required time in the stash while I meditate what I’ll do with it. These little bundles of fiber were a great deal. 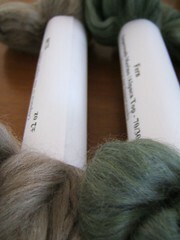 They were from Hokulani Farms and are an alpaca/superwash merino blend. I could resist, and I’ll be plying the two colors together. They’re just 2 ounces each and this will be my first time spinning alpaca. Even though I have a have quite a bit of it in the stash, it requires some washing and picking before it’ll be ready to spin. I think I’ve figured out all of the Christmas gift ideas, and have gotten yarn for many of the gifties. Except for a few more Christmas purchases, I’m now going to be on a yarn diet. Why? Because the time has come fore the payment of student loans. It’s been perfect timing because my violin studio is now full! However, it doesn’t leave a lot of yarn money, and I don’t need to be making any purchases. I have enough yarn to have a closet full of hand knit clothes. I’ve been trying to get some of my projects off the needles to make way for Christmas knitting, and I finished my Mystery Stole. Lace blocking photos to come soon! I’m even further behind! I still haven’t blogged OFFF, because I haven’t blogged anything for awhile. Congrats on the full studio!